If you want a hassle-free removals company for your move to or from Fleet, you’ve come to the right place. Robinsons have been helping families move in and out of the area or over 120 years, so we’re definitely qualified for the job! Moving house is an emotional and stressful experience for anybody, but it doesn’t have to be with Robinsons. We can take the hassle out of your move with our stress-busting service. We know that moving to an unfamiliar place can be intimidating, so feel free to ask any of team members for advice about the area. 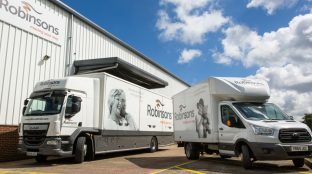 Robinsons is much more than a removals company, we’re here for you in all aspects of your move. Call us today on 01252 364 122 to discuss your requirements with one of our Fleet Move Managers. For a free, no obligation home-moving survey and quotation, fill in your details in the enquiry form above. One of our Fleet Moving Consultants will visit you for an informal chat about your upcoming move. If you’d like more information, don’t hesitate to speak to us directly: please call us, free, on 01252 364 122. We’d love to know more about you and your move.